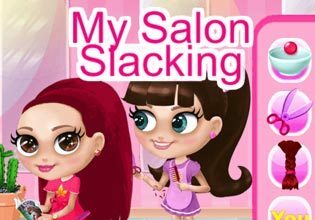 Salon Slacking features twelve mini games in the typical slacking games style. Anna has landed the perfect job within a hairdressing salon. She has to tidy up the salon but she also helps out to cut and dye hair and even does the make-up and chooses the accessories for her customers. Will they love their new look? Or will Anna's slacking get her into trouble? Help her out and make sure the customer doesn't catch Anna slacking off. If the customers pays attention you will get noticed by a huge exclamation mark on the screen and you should stop slacking immediately. The game features beautiful graphics and an infectious soundtrack. Play Salon Slacking now for free! With the different mini games fun is guaranteed for hours and hours.